The Riverside Pirates soccer team bursts through a banner as part of the pre match activities at the Lamb Weston Soccer Field in Boardman on Saturday. 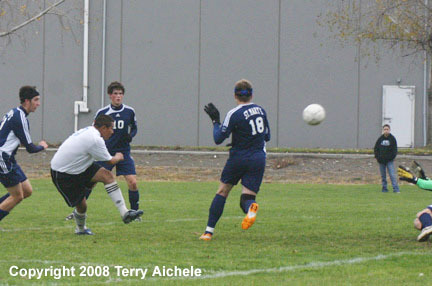 BOARDMAN - The Riverside Pirates hosted St. Mary's of Medford in OSAA soccer playoff action on Saturday, November 8, 2008. The weather cooperated with mostly cloudy skies with no wind or rain and the temperature in the mid 50s. 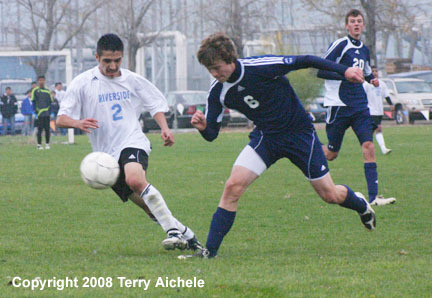 Riverside won 5-1 after a slow first half that ended 1-0. The first half had both teams take quite a bit of time to adjust to each other's play. The Pirates controlled the ball in the St. Mary's zone increasingly as the half progressed. Riverside took about 13 shots on goal to St. Mary's five. Riverside scored the first goal off a corner kick that bounced around in a clump of players in front of St. Mary's goal until Juan Colin, a Riverside forward finally scored at about the 16 minute mark. The second half Riverside's offense came alive but it took some time. Riverside's Favian Madrigal scored a goal at the three minute mark. The first of three for Madrigal's hat trick. That gave the Pirates a 2-0 lead. 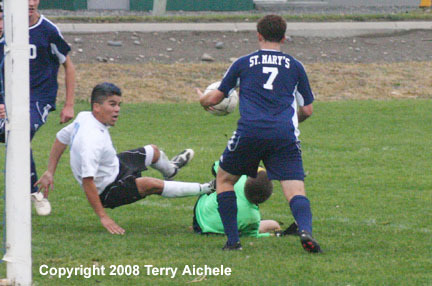 At about the 22 minute mark of the second half Lou Arne of St. Mary's scored on a penalty kick that he aimed to the goalkeep Alberto Ruiz's right corner. That tightened the score to 2-1. Riverside started to put on more pressure in the last 20 minutes of the second half. Favian Madrigal scored his second goal on a run up the middle at the 28 minute mark. Iovani Barrera scored in the 31 minute of the off a deflected pass to give the Pirates a 4-1 lead. Madrigal scored again in the 40th minute to give Riverside the 5-1 win. After the match Favian Madrigal said, "It feels great. It will feel good going on in the playoffs. I'm ready to go on to state." "Played better than last week," was Iovani Barrera's comment. Barrera scored in the second half. "Everyone played really good." "Going on in the state playoffs feels really good." Said Juan Colin who scored in the first half. "I know Umatilla will come on hard to us. You never know what will happen in the playoffs. I want to be in the final." 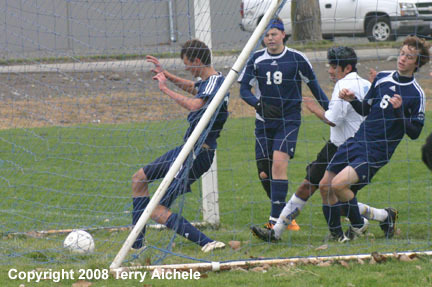 Umatilla traveled to Portland Adventist on Saturday and won 2-0. 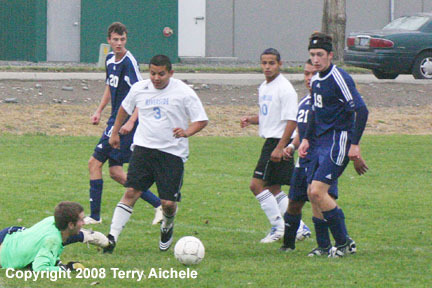 Umatilla will host Riverside on Tuesday, November 11 at the soccer field near the Umatilla Marina at 1PM. 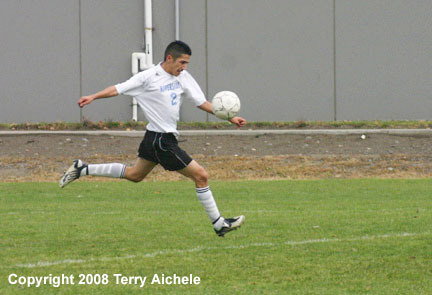 LEFT - Riverside's Iovani Barrera takes a shot on goal early in the first half of Saturday's match. 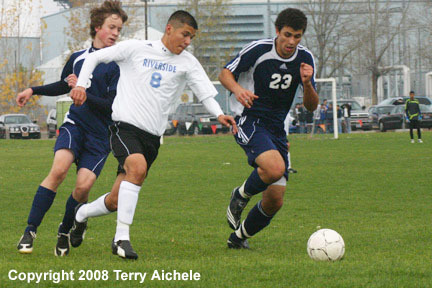 RIGHT - Favian Madrigal of Riverside brings the ball into the St. Mary's zone in the first half of the match on Saturday. LEFT - Alejandro Pacheco of Riverside makes his way against Noah Conway and Kelley Mosley of St. Mary's. RIGHT - Juan Colin of Riverside takes a shot on goal during the first half. 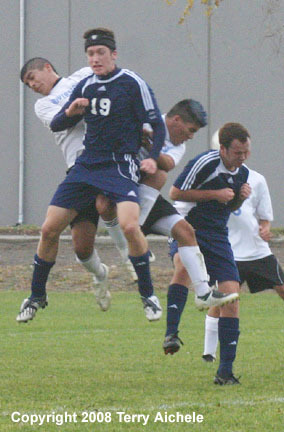 LEFT - Riverside and St. Mary's players leap into the air in an attempt to control a high pass. RIGHT - Favian Madrigal of Riverside makes his way against Noah Conway of St. Mary's. 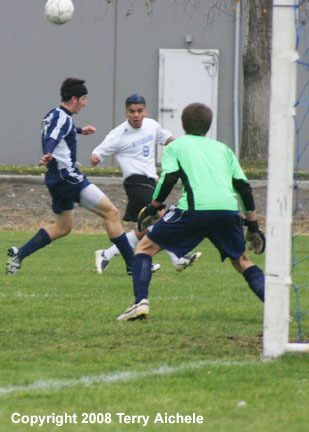 LEFT - Boardman's Hugo Morales takes a shot on goal during the first half of the match on Saturday. 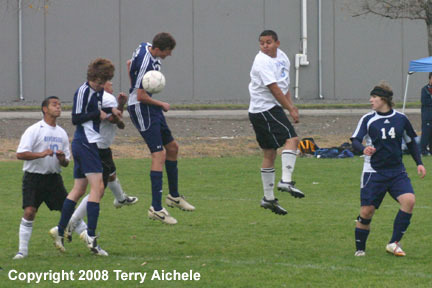 RIGHT - The St. Mary's goalkeep kicks the ball back out of the penalty box through players from both teams. 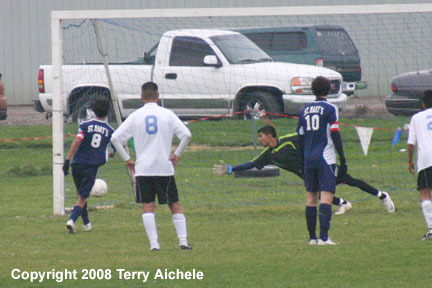 Favian Madrigal of Riverside takes a shot on goal early in the second half of Saturday's game. LEFT - Players continue into the goal as the ball bounced around in front of the goal. 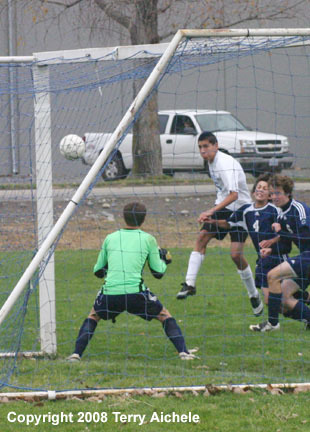 The goal was scored by Riverside's Favian Madrigal. 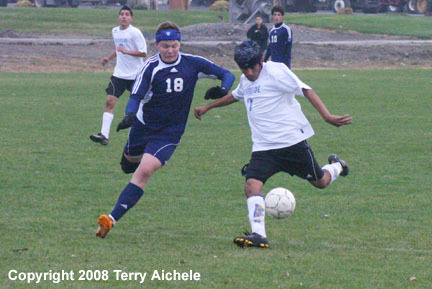 RIGHT - Manuel Flores of Riverside takes a shot on goal. LEFT - Francisco Martinez of Riverside takes a shot on goal that misses off the goal post. 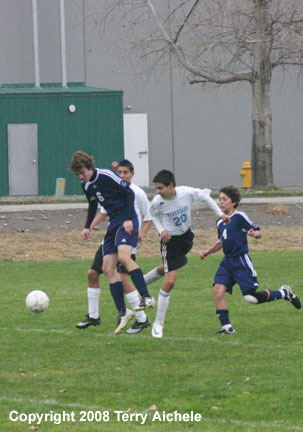 RIGHT - Hugo Morales of Riverside sets up to pass the ball while being tightly guarded by Elliott Coughlin of St. Mary's. 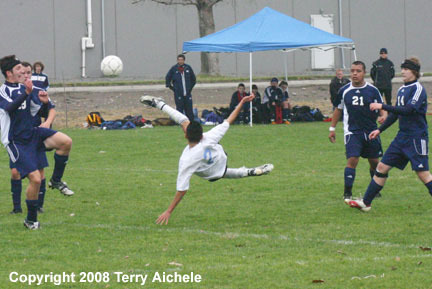 LEFT - Favian Madrigal of Riverside hits a bicycle kick during the match against St. Mary's on Saturday. RIGHT - Juan Colin leaps into the air following a shot on goal. 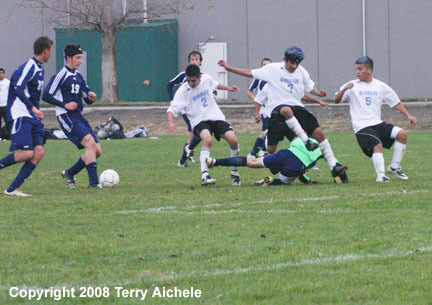 LEFT - St. Mary's goalkeep reaches for the ball following a shot on goal. RIGHT - Lou Arne of St. Mary's scores on a penalty kick in the 22nd minute of the second half to make the score 2-1. LEFT - Iovani Barrera of Riverside takes a shot on goal. 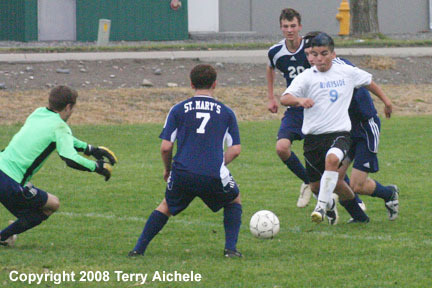 RIGHT - The St. Mary's goalkeep attempts to control the ball while Iovani Barrera of Riverside flies in the air. 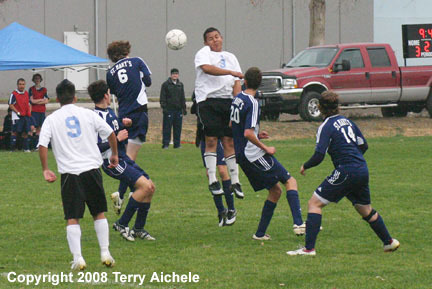 Juan Colin of Riverside with a header. 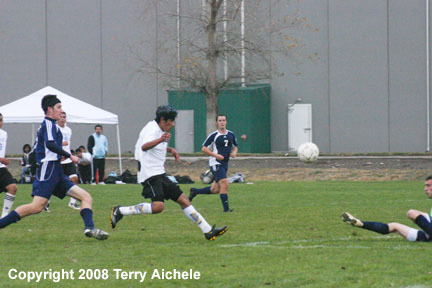 Iovani Barrera of Riverside attempts a shot on goal and hits the side of the goal. 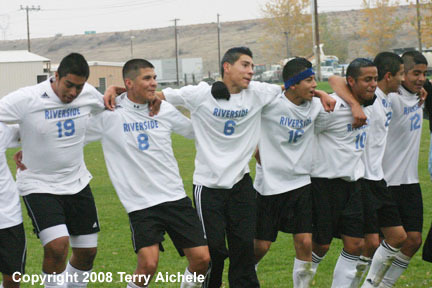 Riverside players dance in celebration of the win in front of their fans on Saturday. 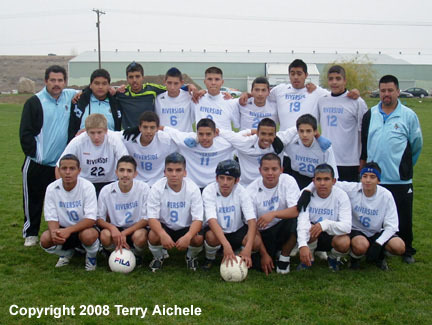 LEFT - The Riverside Pirates gather for a team photo after the match. 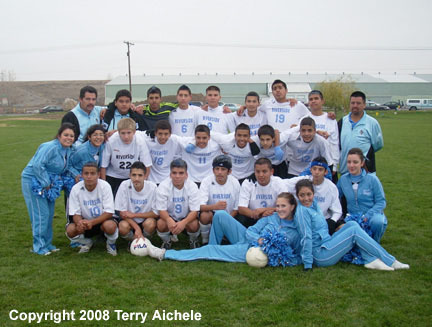 RIGHT - The Riverside Pirates and the Riverside cheerleaders gather for a team photo after the match.